We will hold an information session for UNKNOWN ASIA 2018, an art event that gathers and facilitates exchange between creators and reviewers from various countries in Asia and opens opportunities for Japan and Asia. Producers from Japan will go to Bangkok to give an overview of UNKNOWN ASIA 2017 and describe its appeal. They will also review the visitors’ portfolios and give advice on how to flourish in Japan and Asia. Additionally, one visitor will be selected as the guest artist to be awarded a participation support fee. From Osaka to Asia, from Asia to Osaka. Since established in 2015 with the theme of “from Osaka to Asia, from Asia to Osaka”, this annual art fair has been receiving remarkable attentions and feedbacks from home and abroad beyond an art exhibition to show but brings a unique opportunity in gathering creators, judges, reviewers and public audiences from Asia at one place to discover chances in unknown Asia. 180 creators participated and over 5,000 audiences came in 3 days including the preview day in 2017. 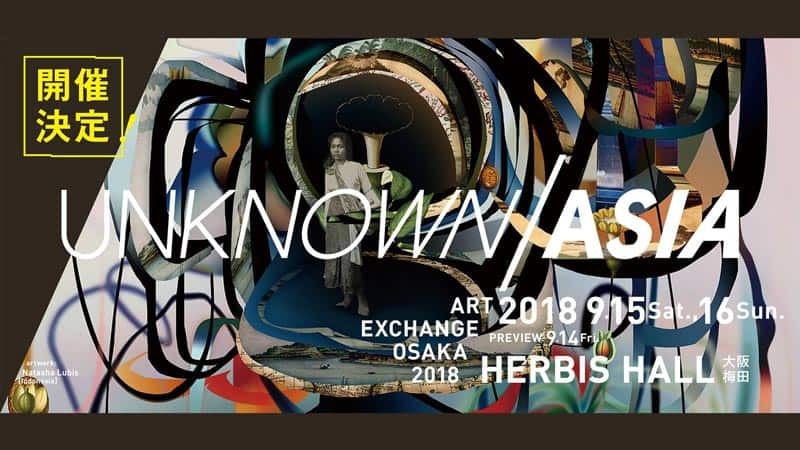 The UNKNOWN ASIA ART EXCHANGE 2018 presents unique and exclusive programs to support artists participated. The UNKNOWN ASIA invites famous art directors and gallerists in Asian countries including Japan as judges. Artists won the grand prix and other awards will be granted opportunities such as exhibitions at omnibus art events inside / outside Japan to introduce their artistic talents. Business matchings opportunities by sponsors and participation organizations are one of supportive program by the UNKNOWN ASIA. Time of business matching review by more than 100 of editors, art directors and gallerists is also planned on the preview day September 14th 2018. We start to call for artists to participate the UNKNOWN ASIA ART EXCHANGE 2017. Participation opens regardless artistic category in art, design, photograph, illustration, fashion, film, installation and others. THE UNKNOWN ASIA looks for talented artists with infinite potential for growth in Asia. Please read following guidelines to applicants and apply to open a door to Asia with your creativity. A new sense of art fair that the next generation creators gather.